Mumbai : ZEE5, one of India’s leading digital video on demand platforms, has been consistently setting the audience expectations higher with new digital premieres every week, fresh off the theatre. This week, to fortify its content library even further,ZEE5 premieres Tamil film Mercury, a silent thriller written and directed by renowned film maker Karthik Subbaraj. 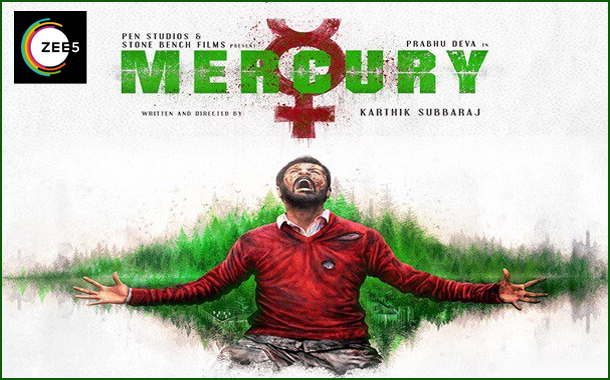 Mercury has a power packed star cast including Prabhu Deva, Remya Nambeesan, Sananth Reddy, Narendran, Deepak Paramesh, Shashank Purushotham and Anish Padmanabhan. Mercury revolves around five friends who try to cover up a death of the friend who accidently died of mercury poisoning. Problem arises when the dead friend comes out of his grave! Will he take revenge? What is the truth behind his death?